Granola is one of those things that can be enjoyed any time of day. It is fabulous on yogurt and it works just as well on vanilla ice cream. We’re picky granola eaters in our house. We like granola that has a good clump to it and I finally found something that fit the bill perfectly. 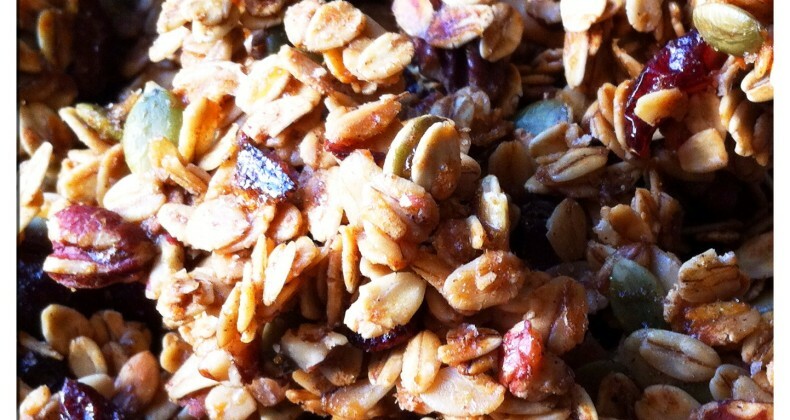 Personalize your granola with your favorite nuts, seeds, and dried fruits. This recipe makes a large batch so fill it up with things you love. The recipe below is what we like. It started as a “clean the pantry out” ingredient list and now is a favorite. Preheat oven to 250. Use 2 baking sheets lined with parchment for this --you don't want your granola crowded. In large bowl mix oats, nuts, berries, and salt. Mix together brown sugar, maple syrup, honey, molasses, vanilla, and oil in microwave safe cup/bowl. Cook for 1 min. Stir making sure sugar is dissolved. Pour over granola and stir making sure to evenly coat everything. Divide granola between baking sheets, spreading evenly and pressing down so everything is in a thin tightly packed layer. Cover loosely with foil. Bake for 30 min. After 30 minutes switch pans so pan on lower rack doesn't burn. Bake another 30 minutes. Remove foil and bake another 15 minutes so granola can brown. Remove from oven and let granola cool completely. DO NOT SNITCH!! :) Granola needs to stay together in order to get the best clumping after it has cooled. Once it has completely cooled break into clumps. On my list of must-dos is make granola!! After making your own you just cant eat the boxed kind! Love all the goodies in your granola! !